I know it will pain you to hear this from a 51 year old reader, but I grew up on your political writing. You were the best, and I learned a great deal that I’ve put to use in a writing career of my own. But you share this with another former champion who fears the effects of too many more blows to the brain, Kurt Warner. Speaking, no doubt, as one of the elitists — or at least, certainly, as a member of an elite — excoriated by Ms. Palin, your assessment of the half-term governor missed on three levels. 1) You got the affect wrong. You have a sense of what is off in Palin’s presentation in your remark that she wore poorly in the suburbs in the last election. Hers is not a populism of the mass against the few, but rather of one pissed-off minority against the many…and that’s what wore so ill last time out. Her line “How’s that hopey-changey stuff working out for you” is not how Huey Long rallied his supporters, nor John Edwards, nor the best high-low campaigner of a generation, Bill Clinton. Rather, it’s the language of the mean-girl clique in high school, striking out at those less fashionable than they, whom they yet suspected might win the marathon of life, however many high school sprints they lost. Those who were stung by such jibes then haven’t forgotten, and there were a lot of them/us. That’s why Tina Fey was so destructive to Palin — she has that vibe pitch perfect, and she knows why it grates….that you don’t suggests your ear is going…and that’s death for a columnist of the zeitgeist. 2) You underestimate the meaning of seemingly minor slips. That handprompter stuff matters for the same reason that Gerald Ford’s stumbles did, or Quayle’s “pototoe” gaffe did. No one thought those were essential to the quality of either man, but they reinforced already present impressions: those guys were dumb. The dominant perception of Palin at the end of the campaign was of someone with enormous performance skills who was out of her depth as an actual prospective leader. She’s already compounded that by her inglorious exit from a governorship that was already, within Alaska, seemingly taxing her powers. Now, seemingly, she needs to be reminded that she is supposed to be able to talk about energy. It may seem trivial to you…but when those Americans not overwhelmed by her ability to read a prepared speech think about Palin not as a kind of political entertainment — a role at which she undeniably excels — but as an actual leader tasked with, say, dealing with the Iran nuclear buildup or ensuring that FEMA doesn’t blow the next Katrina, then stuff like this matters. And it does, as I know you once knew, for reasons the “dean of the Washington press corps” shouldn’t need reminding: because it reinforces what we already, as an electorate, think we know about Palin, which is that however rousing she may be on the stump, she’s a lightweight. Well, fine. But even if the Republican Party is putting this notion to the test, still, in bad times even more than in good, there comes a point in any campaign when you have to say more than you will provide common sense solutions. You actually have to say something about what those solutions are. In fact, Mr Broder, if you approached the job the way you once did, you’d wonder: what would a President Palin do about the fiscal ramifications of the status quo in health care and pensions? What does Palin plan for Iran and Afghanistan and relations with China., or salaries for Wall St. execs…and so on. And you’d find out either that she wouldn’t tell you…which, over time, becomes an enormous vulnerability that a candidates as sophisticated as, say, Mitt Romney would exploit with glee..or that she would, which is, as you know, death to a persuasive populism, (and would give a debater as thoroughly expert as President Obama an enormous opportunity). So — what I’m trying to say is that this column is both wrong and sad. Wrong, because you have no idea what Palin sounds like outside the circles in which you already know all the changes to be rung. You take a speech to 1,200 paying customers as an indication of her ability to transcend enormous real and atmospheric limitations…and you don’t ask if there is any other source of insight beyond your own gut feeling, and those of the same people you’ve hung with for way too long. And that’s what makes it sad. You used to be a contender. Hell, you used to be the champ — and that for years. But this is tomato-can stuff. There is no actual reporting (which is what made your old punditry so strong, that base of actual non-obvious information and experience sought from the ground up), there is no actual analysis, there is no thought given to whether Palin’s attempt at populism is modeled on the same lines as successful populist insurgencies of the past. There’s nothing, in fact, except some guy’s response to an energetically delivered nasty speech. You used to be good. You could be still — but only if you put in the same kind of effort and distilled the insight captured in the arc that connects the two artworks I’ve chosen to illustrate this post. But you’re not even trying anymore. It’s time to go fishing. Sincerly, and regretfully, from someone who’s read and admired you for the better part of four decades. It’s harder than I thought it would be to weigh in with a blog-review of Rebecca Skloot’s new book, The Immortal Life of Henrietta Lacks. It’s not that I don’t like the book – it’s wonderful, and I highly recommend you all go read it. It’s not that I don’t have some thoughts about the work. It offers plenty of grist for engagement, from its compelling story to some formal considerations in the writing, to the practical lesson Rebecca is giving us all on what it takes to promote a book in this late-stage of the traditional approaches to publishing. It’s not that there isn’t a wealth of material to talk about. Rebecca has written a compelling story, a genuine page turner, populated with characters – people – whom you come to care about deeply, that is at the same time an important inquiry into issues of race, class, personal autonomy and the claims of authority in America. It’s just that all of this has been said already. I agree with the assessments of the host of reviewers and bloggers who have already weighed in on the book: it’s a great achievement, it’s a compelling read, and it is at once emotionally moving and intellectually demanding, which is my idea of a fine, fine book. Well, I’ve got one thing to say more from my perspective as a writer who also teaches writing than as a straight reviewer/critic. At least one of Rebecca’s choices of technique in this book was hard won, complicated, and very important to the ultimate power of the work. That is: a number of people have noted what they see as the use of some of the story telling tools from fiction in the tale – and that’s certainly fair. Her telling of scenes from the story of Henrietta Lacks herself with a novel’s third person, seemingly omniscient narrator is a case in point. But to me the dominant source-genre for the book is not fiction but that very tricky approach to non-fiction that falls under the umbrella of memoir. I heard Rebecca tell Terri Gross on NPR’s Fresh Air that she resisted inserting herself into the story until it became inevitable, until her odyssey with the Lacks family became so intimately intertwined with what she thought her formal narrative to be that she had to emerge as a character in her own book. With that we’re off, and we are able to understand the entire work that follows as a journey undertaken by a maturing Rebecca to come to grips with that sudden, strange, and almost comically opaque revelation. That journey is not undertaken by an omniscient narrator, for all that the device shows up here and there; we don’t have a Virgil on this sometimes infernal journey. Rather, we have Rebecca herself, a changing person and voice, someone with accumulating, always incomplete knowledge. Most important for the power of the book, Rebecca is implicated in the tale: each discovery she makes has both an explanatory signficance and an emotional one, for her. And hence for us, once we’ve invested our concern in the teller of the tale. By the way, in this I don’t mean that Rebecca comes to dominate the story. Henrietta herself, and even more, Henrietta’s daughter, Deborah, are the emotional centers of the story. But that’s how memoirs work. 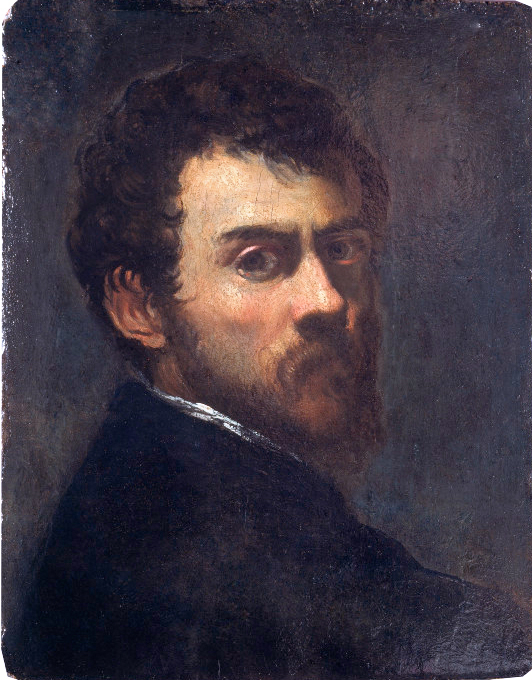 They are not simply, or even mostly (in the best ones) about the author; rather, they provide a bridge through the author to sympathy with the people and experiences encountered on a life’s journey. A keen memoirist uses what she or he knows to be a subjective view to create a connection between the reader and both what and the way she or he sees the world. That’s what makes the most controversial scene in Rebecca’s book so valuable, narratively. At one point, in the midst of Henrietta’s family, Rebecca experiences a kind of exorcism. She’s a rationalist, a science writer, for heaven’s sake. And yet this experience is real, felt and…as written, present for the reader. All of which is to say, that memoir isn’t just a “what I did today” account of a life: it is a conscious and complicated narrative stance, which, when wielded by a writer of skill and sensitivity constructs a world fo feeling out of an account of fact – or what seemed like fact as lived. Doing it well is really hard – and having done so is one reason that Rebecca produced a book that works so well. 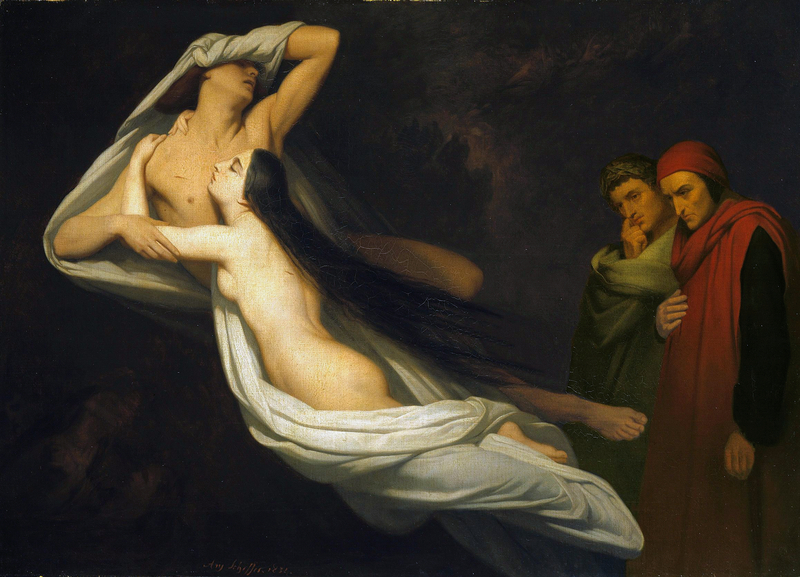 Image: Ary Scheffer, “Dante and Virgil encounter the ghosts of Paulo and Francesca” 1854. There are some things the British do better than anyone else, high/low intellectual comedy being one of them. If you have my particular turn of mind, this is coke through the nose stuff. (h/t Scav, at comment 19 in this surreal thread over at Balloon Juice. Jim K., in this comment thread takes issue with my claim that anti-tax glibertarianism is (a) one of the root causes of Colorado Springs’ current predicament and (b) is powering a potentially deep decline in American wealth and power. The issue, he says, is not the shortfall in taxes, but the “abomination” — his word — that city employees are overpaid, excessively well-benefitted, and inflexibly secure in their jobs. This labor greed and rigidity, and not the collapse of tax revenues in the context of anti-tax politics is to blame for the loss of police and fire jobs, the darkening of city streets and so on. The argument that folks like me (who are apparently wrecking the American way of life) have is not with government provision of services per se but the fact that a great proportion of the dollars we are paying into the government these days is going to support unsustainably high compensation schemes for government employees. 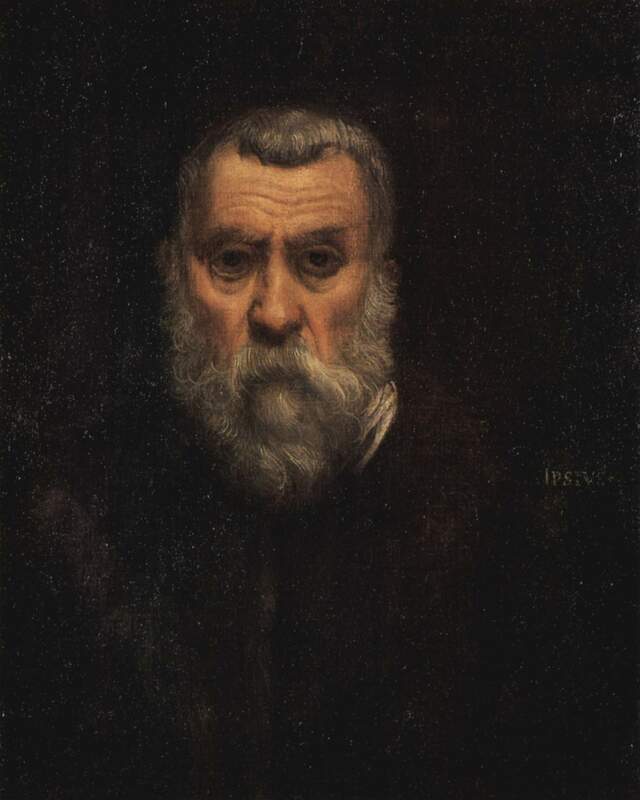 To demonstrate how iniquitous is this burden, he offers some numbers: a presumed final salary after 40 years of work of $75,000 that would, he claims, linking to the Colorado public pension system’s benefit calculator page, yield a 100% pension — the equivalent, he asserts of an annuity that would cost one million dollars and change to buy on the open market. Additionally, most state employees do not fund any contributions to their pensions from that 75K. Sounds bad, I guess — except for two problems that are to me illustrative of the absolute intellectual poverty for what passes for libertarian argument in this country. First, such arguments are usually deeply empirically challenged, as they are here. That is: Mr. K.’s key numbers are wrong, apparently simply made-up. It may be true that if you, as Mr. K. says he did, “plug some numbers” into the the benefits calculator you get a retirement payment equal to your salary at retirement. But no actual Colorado public employee does. There’s more, of course. Mr. K. asserts that most state employees don’t contribute to their pension plans. Maybe in his universe, but not in this one. The Colorado plan, PERA reports that in 2008, employees contributed $717 million to the plan, while employers provided $863.5 million. You can, I suppose, argue about the appropriate ratio — but the key message is that, of course, Mr. K. said something flat out wrong that, conveniently, supports his myth of the leech-like viciousness of public servants. In the real world, the employees of Colorado Springs have been paying significant amounts to their own future compensation. At the same page, you’d find that the average monthly retirement benefit for 2008 was $2772, which annualizes to all of $33,264 — not nothing, truly, but hardly the caviar and Cadillac compensation of Mr. K.’s fever dreams. Enough: you get the point. Mr.K., like many of the anti-government crowd I’ve argued with in the past, feels free to assert what he is convinced must be true. That’s behavior I recognize as I raise my small son — but it is something that, thankfully, at age nine, he has begun to outgrow. It seems a developmental disorder afflicting much of the body politic that a similar progression has not taken place amongst too many alleged adults. What else am I forgetting? Health care benefits, much better job security, and hours and holidays most of us would envy….What is really destroying the American way of life, the unwillingness of some of us to pay ever more to support this abomination or the fact that we have created a class of citizens who demand ever more of our money in return for keeping the streetlights on? Hey! I thought class war was for my side! I don’t doubt that there is waste and sloth and indifference in government service. Hell, I’ve seen it in every business or institution I’ve owned or worked for, so I don’t see why the public sector should be any different from the private and non profit ones. First, that contracts may be binding for thee and me, but not if your contract happens to be collectively bargained and between an individual and the state. The cop who started work ten years ago signed on to a challenging, difficult and sometimes dangerous job in exchange for a defined compensation package. Now we should throw this away? I don’t think so. Second, that whatever we pay our civil servants is always too much, and hence ill-gotten, which is why it is OK to cut people’s pay while expecting them to provide the same labor. Here’s the horrible truth: we don’t pay civil servants very much, really. A Colorado Springs police sargeant makes, broadly, between $55,000 and $70,000 — or roughly $27.50 to $35 an hour. That’s for an experienced person in a supervisory role, working a job that requires considerable expertise and specialized skills, not to mention acceptance of the risk inherent in police work. Why do skilled and smart people do the work — be they cops, teachers, whatever? Because they like it, one hopes, but also because they accept a bargain — they’ll take a constrained wage in exchange for security and good benefits. Take some part of that bargain away, and you’ll lose folks. Usually the best ones, if you accept free market notions of rational self-interest, which I do. So you have to ask yourselves: Do you feel lucky today? How much do you cut before these kind of people say f*ck it, and move on? Seriously: you can always cut something. But you lose something when you do. And if you have so committed yourself and your community to the idea that government is an abomination, it should come as no surprise that the cuts start to hurt. But it does, which is why folks like Mr. K. have to make stuff up to get the horrible facts of real life out of their heads. To which I say — move to Colorado Springs! Show us what paradise can be. I double dog dare ya. 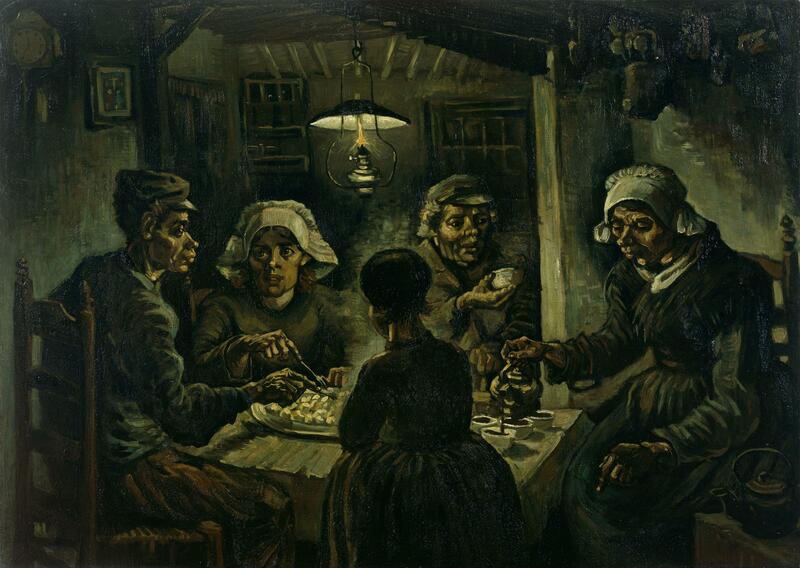 Image: Vincent Van Gogh, “The Potato Eaters,” 1885. I see from a rather intemperate comment on this post that Megan McArdle has committed a cardinal error: never give a (sadly) obscure critic the satisfaction — or the notice — that may render them (and their critiques) less obscure. Ms. McArdle actually has just a bit of a cause for complaint. She writes — at more length than I would have thought the provocation deserved, but such is blogging — that I accuse her of claims she has not made, that she is in fact a supporter of government in its proper place, and that therefore I should not have associated her with Colorado Springs’ announcement of severe cuts in government services brought on by a revenue shortfall. On reflection: she has not posted any opinions on Colorado Springs tax or spending policies, so far as I know (I don’t read her regularly enough to be sure — rather I ration myself to a kind of once a month rubbernecking of the analytical and journalistic trainwreck her blogging (and the next three parts of the tome that begins at that link) presents to make sure I don’t get too caught up in documenting the fail). Given that silence, leaping to the thought of someone who used to blog under the pseudonym “Jane Galt” in my bit of reflection on the real-world consequences of a Randian view of government was, if predictable, something of a stretch — for which lapse I apologize. …have I ever advocated getting rid of the police, streetlights, or education spending? Why no, I haven’t! Of course that way requires actually firing up Google, which means you could sprain your fingers. You can understand why Thomas Levenson didn’t want to risk it. Let us leave aside how the wounded soul ramps up the rhetoric…after all my contempt for Ms. McArdle’s work should be clear from the pieces linked above, so I can’t exactly fault her for her attempts at returning the favor. But, in fact, you will note in the objected-to passage that I did not say the Ms. McArdle favored the things she says she does not. What I did and do assert, in effect, is that in the body of her work you will find a consistent argument that government cannot perform well a broad array of functions, including those that many of us, at least would recognize as essential. See for example, this post, which I excoriated here and here. It is certainly true that when you pound through Ms. McArdle’s posts you will find support for some government actions — not health care reform, in any of its current guises, nor many aspects of proposed financial reforms and so on — but certainly some taxes (on health care plans, among other targets) and in some areas. But she’s much more nervous about a lot of other stuff too — regulating or legislating against credit card company exploitation of seniors suffering from dementia, for one example, because, in her view constraining such behavior would involve too great a transfer of individual autonomy to governmental paternalism. Rather, what I’m saying is that, for all of Ms. McArdle’s claim of balance and the pure exercise of sweet reason, when it comes down to cases, she most often defaults to the ideal of an individual’s choice trumping an assertion of a common good that requires some constraint on or cost to the individual. There is both a logical end (drown government in a bathtub) and a practical outcome that derives from that kind of thumb on the intellectual scale. And I stand by my claim a real-world example of that endpoint can be seen right now in Colorado Springs. So no, I don’t think, nor did I ever say, that McArdle wants to fire every cop in Colorado. What I do think, and say, is that there are recognizable consequences to arguments consistently made…and Ms.McArdle’s position leads in practice, if not in the theory that lights the spotless sunshine of her mind, to local disaster and, unchecked, the long term erosion of American power and (relative) wealth. 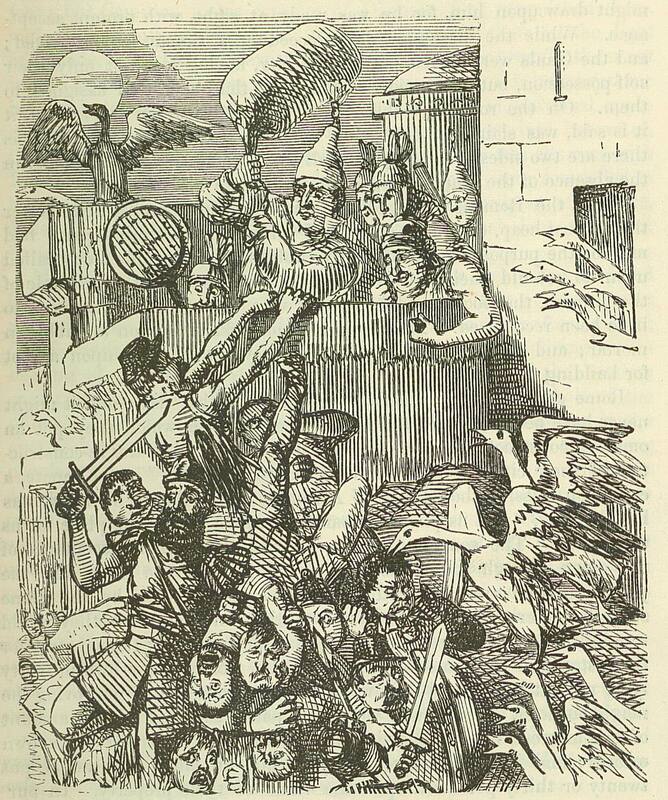 Image: John Leech, “Rome Saved By The Cackling of Geese” from The Comic History of Rome by Gilbert Abbott A Beckett, c.1850. This, from the Denver Post, on the city of Colorado Springs’ discovery that taxes actually pay for things that people, you know, need and use. (h/t Atrios). This is, among other things, what folks like Megan McArdle never seem to get — not merely that governments do things that (a) private entities won’t and or can’t and (b) that are necessary if you are, say, going to have thousands or millions of folks living in close proximity to each other, and (c) those things that need to be paid for — by the people in common, that is to say, by government — include a bunch of stuff essential for a sound economy and any chance of achieving what is commonly thought of as the American way of life. That is — it might be hard to quantify the contribution of adequate street lighting to GDP — but ask yourself what it would do to retail sales to have pools of darkness every thirty feet along a commercial street. Or — it may not show up on a a monthly report of manufacturing output, but ask yourself whether the long-tail consequences of a diminished police presence in a factory district might include an impact on that district’s safety, and hence production — or if a change in fire response times could translate into altered insurance costs. And you don’t even have to ask the speculative question about the value of investment in school facilities and in the quality of public schooling as discovered in very real dollars in the home valuations realized by property owners in the relevant districts. That’s on that answers itself. It is possible, if you are a true believer, to imagine a gated world in which the “accomplished” secure for themselves all those qualities of life they seek on piece-work/piece-paid basis. Dystopic science fiction turns on this conceit, among others. But I’m a believer in Jane Jacobs work. And the key message of her Cities and the Wealth of Nations is that you need thriving, diverse (in every sense of the word), and ambitious cities to generate the range of activities that produce both healthy economies and polities. To get that, you need some sense of a common stake in the civic enterprise. You need to be willing to pay to keep the streets lit, potholes filled, police on their shifts and schools capable doing more than riding herd on the pre-unemployed. Any society can tolerate some proportion of the unconsciously lucky in the delusion that their comfort is insulated from any external shock. It cannot survive when that belief becomes an epidemic psychosis with an incidence >50% in one of our would-be ruling parties. Don’t believe me? Just ask the good, tax-averse citizens of Colorado Springs. Image: Wojciech Gerson, “Merchants in Danzig” 1865.